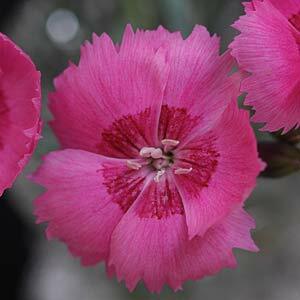 Wonderful old fashioned Dianthus are some of the best low maintenance cottage garden plants offered by wholesalers. A huge range of colours and forms of this easy care sun loving plant are available from wholesale nurseries. Dianthus or ‘Pinks’ are a fragrant flowering ground cover suitable for landscaping uses. Flowering from late spring though to autumn most flowers are in shades from red to pink, white is also common. However with the large variety of plants a greater variety can be found. Seen as a cottage garden plant they also grow well in containers and window boxes. Varieties range from low growing ground cover types to taller growing cultivars used for cut flowers and a few ‘novelty’ types like Dianthus ‘Green Trick’. Sold by wholesale nurseries in pots as well as in trays for mass planting and broader landscaping applications. Dianthus require a well drained soil with a neutral Ph. Best in full sun to light afternoon shade.